I'd be extremely grateful for expert advice on how to optimise Dolphin to run on my system. I believe my specs are already visible in my Sig - if not, I'll add them in a minute. I've read several articles in the Wiki before posting - including the work-in-progress manual - and I've made a few advancements on my own. 1). Direct3D9 is the only video backend to run reasonably smoothly. 2). DSP LLE interpreter sounds great, but whenever more than a few sounds are playing at once it all falls apart - so I have to make do with DSP LLE recompiled. 3). Putting DSP LLE onto a separate thread makes performance worse, rather than better. (I'm currently using XAudio2 as the audio backend - not for any reason, other than Dolphin defaults to it). 4). I seem to be able to ramp-up anti-aliasing and anisotropic filtering as far as I like without any change in performance, so this is maxed-out - but V-Sync makes a difference, so I've turned that off. 5). Internal rendering does make a significant difference - the graphics becoming increasingly choppy as I crank it up. Using OpenMP doesn't seem to improve this, and OpenCL makes the emulator hang - so I don't use either of them. a). I have dual-core and idle skipping checked. b). Framelimit is set to Auto (not limited by FPS). c). CPU emulator engine is set to the recommended JIT. d). I am running Dolphin at a full-screen resolution of 1920x 1080, with a forced 4:3 aspect ratio. e). The only Enhancement box I have checked is Scaled EFB Copy. f). In Hacks I have Ignore Format Changes, EFB Copies - Texture, External Frame Buffer - Disable and Fast Depth Calculation checked. g). Nothing checked in Advanced. My ambition would be to run GameCube games as smoothly as possible. If I have headroom for Enhancements, great. If not, accuracy of look, sound and feel is what I'm after. Um, Metroid Prime REQUIRES EFB to RAM. Without it, the Thermal and X-Ray Visors behave improperly. In fact, EFB to Texture is explicitly disabled in the game INI for this reason. LLE Interpreter is the worst option when it comes to select an audio engine. (10-13-2013, 02:38 AM)dh2005 Wrote: 1). 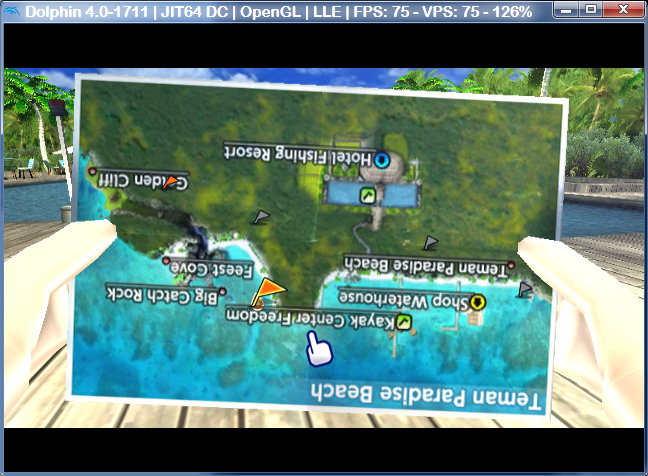 Direct3D9 is the only video backend to run reasonably smoothly. Last Dolphin version with DX9 available is 4.0-146. Remember that. (10-13-2013, 02:38 AM)dh2005 Wrote: (I'm currently using XAudio2 as the audio backend - not for any reason, other than Dolphin defaults to it). The other backends have lots of audio lag. XAudio2 gave the best results for me. (10-13-2013, 02:38 AM)dh2005 Wrote: 4). I seem to be able to ramp-up anti-aliasing and anisotropic filtering as far as I like without any change in performance, so this is maxed-out - but V-Sync makes a difference, so I've turned that off. Set anisotropic filtering to x16, always. You'll have to find the perfect combination of internal resolution and antialiasing for each game. I usually use 3xIR+4xSSAA, but 2.5xIR+4xSSAA for Twilight Princess (with a huge texture pack). Your GPU is much better than mine, so I think you should use 3xIR+4xSSAA minimum. Use LLE recompiler and DSPLLE on separate thread. Only a few games have problems with that. It's a pity that your CPU isn't a k version, but I think sou can still overclock the BCLK instead of rising the multiplier. Thanks for the detailed reply. Really appreciate it. ... would you mind telling me how to set-about overclocking it? Can it be done through firmware? Because this is a very specialised machine (it's actually a bespoke arcade cabinet), so getting at the CPU would be a ball-ache. Also, re DX9 - does this mean that I won't be able to use more advanced builds of Dolphin until OpenGL and DX11 support improves? On most motherboards, you just hit delete/F12/F9/whatever it says when it's booting, and you'll get into your BIOS. If the board supports it, you can then set the BCLK and Multiplier (if you have the K version). Usually BCLK OC'ing doesn't have much headroom, but it's supposed to be more viable on Haswell than Sandy and Ivy. However, not all motherboards support BCLK or multiplier overclocking, so you'll need to check. (10-13-2013, 09:03 AM)masterotaku Wrote: Set anisotropic filtering to x16, always. Also, usually OpenGL with "Vertex Streaming Hack" checked ends up being as fast as or faster than DX9 on Nvidia GPUs. Try that out, see if it's faster. Just a clarification that while opengl is fast with vertex streaming hack, it is usually slower than direct 3d when a game needs Efb to Ram to run. Efb to Ram seems to run slower than all the other backends here at least when using open gl (windows 7 x64 , 560 ti with latest drivers). Remarkably, Dolphin has completely lost its ability to throttle a frame-rate. All I did was change from DX9 to OpenGL, and now it's crocked. Even when I change it back to DX9, it still runs far too quickly. Even when I set a framelimit. The only way I can slow it down is by changing the video backend to Software. That properly makes it chug...!!! Do I need to reinstall Dolphin, maybe?